We tend to take the soil around us for granted. It is much more than mud, clay or dirt. All the food that we consume depends ultimately upon soil. Plants grow and depend on the soil. We either eat plants that grow directly in the soil or the animals that eat the plants. Soils are the part of the lithosphere where life processes and soil forming processes both take place. In this unit we will look at the soil system, soil water, soil formation and the consequences of soil degradation. The soil system is a dynamic ecosystem that has inputs, outputs, storages and flows. 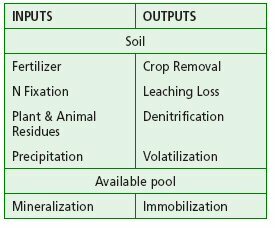 The quality of soil influences the primary productivity of an area..
What value systems can you identify at play in the cases and approaches to resolving the issues addressed in this topic? How does the systems approach help our understanding of soils and soil processes? With respect to soils, how might the environmental value systems of a large scale commercial farmer differ from that of a traditional subsistence farmer? How might the pressure on soils change over the next 20 years? Give reasons to support your answer. 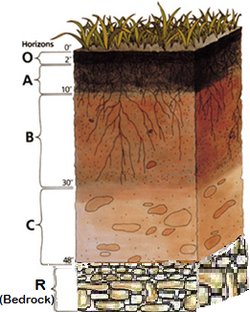 5.1.U1 The soil system may be illustrated by a soil profile that has a layered structure (horizons). Soils are major components of the world's ecosystems.Soil forms the Earth’s atmosphere, lithosphere (rocks), biosphere (living matter) and hydrosphere (water). Soil is what forms the outermost layer of the Earth’s surface, and comprise weathered bedrock (regolith), organic matter (both dead and alive), air and water. The soil interacts with the atmosphere, lithosphere, biosphere and hydrosphere. The water cycle moves through the soil by infiltration and water may evaporate from the surface. The atmosphere may contain particulate matter that is deposited on the soils and particles may blow up into the atmosphere. Rocks in the lithosphere weather to form soils, and soils at depth and pressure may form rocks. Plants in the biosphere may extract nutrients from the soils and dead plants may end up forming parts of the soil. A) Surface Soil: Layer of mineral soil with most organic matter accumulation and soil life. This layer eluviates (is depleted of) iron, clay and calcium, organic compounds, and other soluble constituents. When eluviation is pronounced, a lighter colored "E" subsurface soil horizon is apparent at the base of the "A" horizon. A-horizons may also be the result of a combination of soil bioturbation and surface processes that separates fine particles from biologically mounded topsoil. In this case, the A-horizon is regarded as a "biomantle". B) Subsoil: This layer accumulates iron, clay, aluminum and organic compounds, a process referred to as illuviation. C) Parent Rock: Layer of large unbroken rocks. This layer may accumulate the more soluble compounds. R) Bedrock: The parent material in bedrock landscapes. This layer denotes the layer of partially weathered bedrock at the base of the soil profile. Unlike the above layers, R horizons largely comprise continuous masses of hard rock that cannot be excavated by hand. Soils formed in situ will exhibit strong similarities to this bedrock layer. These areas of bedrock are under 50 feet of the other profiles. 5.1.U2 Soil system storages include organic matter, organisms, nutrients, minerals, air and water. ​Translocation involves the movement of soil-forming materials through the developing soil profile. Translocation occurs by water running through the soil transferring materials from upper to lower portions of the profile. Burrowing animals like earth worms, ants, etc., move soil materials within the profile. Burrowing animals create passage ways through which air and water can travel promoting soil development. 5.1.U4 There are inputs of organic material including leaf litter and inorganic matter from parent material, precipitation and energy. Outputs include uptake by plants and soil erosion. Calcium, magnesium, potassium, sodium, silicon, iron, aluminum, and phosphorus. Large quantities of nutrients are added to ecosystems from the atmosphere. This addition is done either through precipitation or by a number of biological processes. Carbon - absorbed by way of photosynthesis. Nitrogen - produced by lightning and precipitation. Sulfur, chloride, calcium, and sodium - deposited by way of precipitation. Biological nitrogen fixation is a biochemical process where nitrogen gas from the atmosphere is chemically combined into more complex solid forms by metabolic reactions in an organism. This ability to fix nitrogen is restricted to a symbiotic associations with legumes and other microorganisms. Soil erosion is probably the most import means of nutrient loss to ecosystems. Erosion is very active in agricultural and forestry systems, where cultivation, grazing, and clearcutting leaves the soil bare and unprotected. When unprotected, the surface of the soil is easily transported by wind and moving water. The top most layers of a soil, which have an abundance of nutrient rich organic matter, are the major storehouse for soil nutrients like phosphorus, potassium, and nitrogen. Leaching occurs when water flowing vertically through the soil transports nutrients in solution downward in the soil profile. Many of these nutrients can be completely lost from the soil profile if carried into groundwater and then horizontally transported into rivers, lakes, or oceans. Leaching losses are, generally, highest in disturbed ecosystems. In undisturbed ecosystems, efficient nutrient cycling limits the amount of nutrients available for this process. High losses of nutrients can also occur when specific environmental conditions promote the export of nutrients in a gaseous form. When the soil is wet and anaerobic, many compounds are chemically reduced to a gas from solid forms in the soil. This is especially true of soil nitrogen. 5.1.U5 Transformations include decomposition, weathering and nutrient cycling. ​The transformation and movement of materials within soil organic matter pools is a dynamic process influenced by climate, soil type, vegetation and soil organisms. All these factors operate within a hierarchical spatial scale. 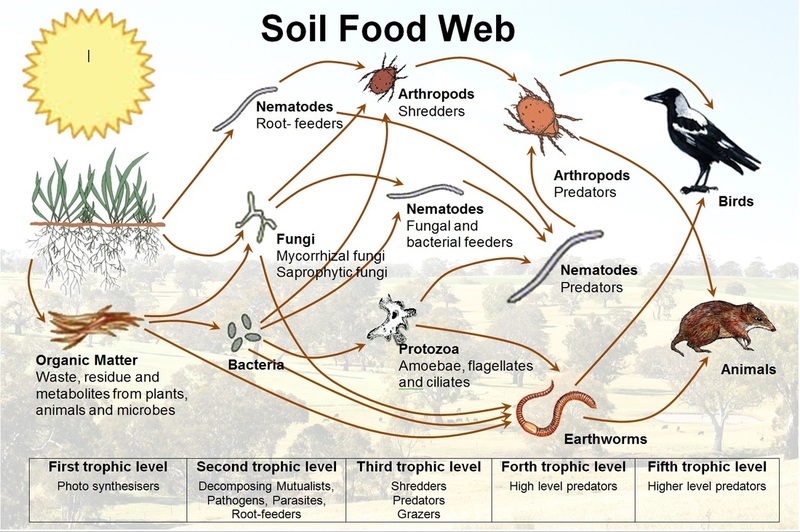 Soil organisms are responsible for the decay and cycling of both macronutrients and micronutrients, and their activity affects the structure, tilth and productivity of the soil. Soil structure affects aeration, water-holding capacity, drainage, and penetration by roots and seedlings, among other things. Soil structure refers to the arrangement of soil particles into aggregates (or peds) and the distribution of pores in between. It is not a stable property and is greatly influenced by soil management practices. Consider mineral content, drainage, water-holding capacity, air spaces, biota and potential to hold organic matter, and link these to primary productivity. For optimum structure, variety of pure sizes are required to allow root prevention, free drainage and water storage. Pore spaces over 0.1 mm allow roots growth, oxygen diffusion and water movement where as pore spaces below 0.5 mm help store water. 5.1.A1 Outline the transfers, transformations, inputs, outputs, flows and storages within soil systems. inputs - physical movement of material within soil. translocations - translocation of materials within the soil profile is primarily due to gradients in water potential and chemical concentrations within the soil pores. transformations - change of some soil constituent without any physical displacement. 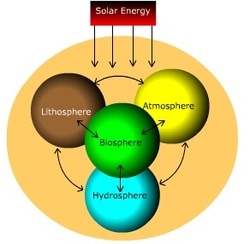 The two driving forces for these processes are climate (temperature and precipitation) and organisms, (plants and animals). Parent material is usually a rather passive factor in affecting soil processes because parent materials are inherited from the geologic world. Topography (or relief) is also rather passive in affecting soil processes, mainly by modifying the climatic influences of temperature and precipitation. 5.1.A2 Explain how soil can be viewed as an ecosystem. Soil is the link between the air, water, rocks, and organisms, and is responsible for many different functions in the natural world that we call ecosystem services. These soil functions include: air quality and composition, temperature regulation, carbon and nutrient cycling, water cycling and quality, natural "waste" (decomposition) treatment and recycling, and habitat for most living things and their food. We could not survive without these soil functions. ​Billions of organisms inhabit the upper layers of the soil, where they break down dead organic matter, releasing the nutrients necessary for plant growth. The micro-organisms include bacteria, actinomycetes, algae and fungi. Macro-organisms include earthworms and arthropods such as insects, mites and millipedes. Each group plays a role in the soil ecosystem and can assist the organic farmer in producing a healthy crop. Micro-organisms can be grouped according to their function: free-living decomposers convert organic matter into nutrients for plants and other micro-organisms, rhizosphere organisms are symbiotically associated with the plant roots and free-living nitrogen fixers. 5.1.A3 Compare and contrast the structure and properties of sand, clay and loam soils, with reference to a soil texture diagram, including their effect on primary productivity. The more clay present in soil the higher the force needed to pull a plough. *Shrinking limit: state which the soil passes from having a moist to a dry appearance. *Plastic limit: occurs when each ped is surrounded by a film of water sufficient to act as a lunricant. *Liquid limit: occurs when there is sufficient water to reduce cohesion between the peds. 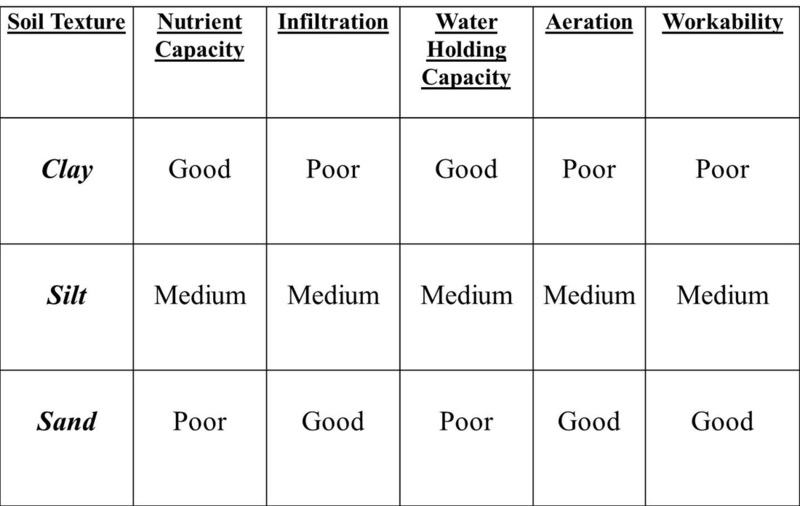 *Field capacity: maximum amount of water that a particular soil can hold. 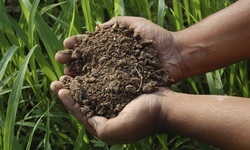 Significant differences exist in arable (potential to promote primary productivity) soil availability around the world. These differences have socio-political, economic and ecological influences. The soil system may be represented by a soil profile—since a model is, strictly speaking, not real, how can it lead to knowledge? ​A new, seven-part video series explores how an increasing number of farmers throughout the country are creating a new hope in healthy soil by regenerating our nation’s living and life-giving soil. Julia Roberts, Harrison Ford, Edward Norton, Penélope Cruz, Robert Redford and Ian Somerhalder all join forces to give nature a voice. Excursion into the realms of soil, the number 1 lifegiver on Earth...It's fundamentally important ecological functions, our poor understanding of it as well as our destructive relationship with it. They are so essential to life and thus to us, that our survival is directly dependent on their understanding and protection! In "Soil Stories", our protagonist, Francine, embarks on a journey of discovery that begins with her realization that soil is alive and that without soil, life as we know would not exist.